MegaMatcher Standard and Extended SDKs include a set of modules that are intended for the development of biometric system's client-side applications. A client application gathers biometric samples, extracts biometric template information from them and sends extracted template for matching to MegaMatcher Server and/or MegaMatcher Cluster Server. VeriEye (Current Version) Extractor component can be used for iris image processing and biometric features extraction. The iris features can be sent to MegaMatcher Server or Cluster Server for identification. The database support modules with source codes and other modules included for MegaMatcher Client component are listed in the table below. Custom modules for working with other databases can also be developed by integrator and used with MegaMatcher Cluster Server components. MegaMatcher Extractor module performs fingerprint or facial image processing and extracts unique biometric features, that are sent to MegaMatcher Server or Cluster Server for identification. The Extractor module can be used with fingerprint images from fingerprint scanners and/or files and with face images from cameras and/or files. .NET wrapper for MegaMatcher Extractor module is included. The module is compiled in native code therefore .Net applications require a special wrapper to access module's API. The Client communication module allows sending a task to MegaMatcher Server, MegaMatcher Cluster Server and MegaMatcher Accelerator, querying status of the task, getting the results and removing the task from server. This component hides all low level communications and provides high-level API for the developer. Fingerprint view component (.NET) shows captured fingerprint image. This component is also able to show extracted minutia points. Fingerprint segmentation module separates fingerprints if an image contains more than one fingerprint. This component enables fingerprints Neurotechnology from scanned tenprint card or image captured using scanners that allow to scan two or more fingers at once. "Unknown" – for the nondetermined classes. Scanners support component allows manipulating scanners that are connected to the PC. See the the list of supported scanners and platform compatability . Camera support component allows manipulating cameras and webcams that are connected to the PC. 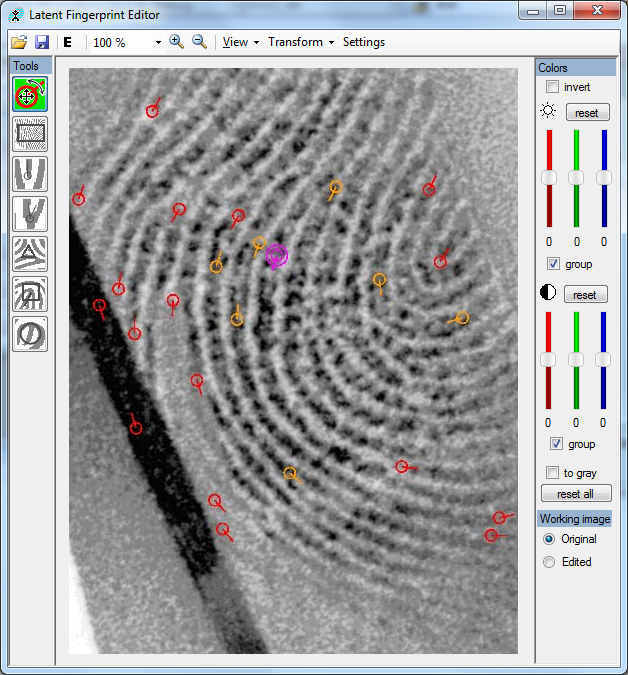 Latent Fingerprint Editor. In most cases automated image processing is unable to extract all minutiae or extracts a lot of false minutiae from latent fingerprint image (for example, taken from the crime scene). Therefore, an expert should manually edit a fingerprint template in order to submit it to an AFIS for the identification. Sample latent fingerprint template editor (.NET) shows how to change minutia's coordinates, direction, type and other parameters. NImages Pro (WSQ) module. WSQ (Wavelet Scalar Quantization) fingerprint image compression allows compressing image up to 10-15 times. WSQ compression process is "lossy", meaning that the reconstructed image isn't equal to the original (some information has been lost). However, the WSQ algorithm was specially designed to minimize the loss of fingerprint information, so that the reconstructed image is as close as possible to the original. MegaMatcher (Current Version) SDK contains a WSQ compression and decompression module, which can be used to minimize storage size of fingerprint images and for data interchange between systems. .NET wrapper is included. NTFI module. Neurotechnology Token Face Image (NTFI) module is intended to provide token * face images compatible with the Face Image Format as in ISO/IEC 19794 standard. This face image format enables range of applications on variety of devices, including devices that have limited resources required for data storage, and improves recognition accuracy by specifying data format, scene constraints (lighting, pose), photographic properties (positioning, camera focus) and digital image attributes (image resolution, image size). Token face image creation from an image containing human face using eye coordinates which may be either hand marked or detected automatically using Neurotechnology VeriLook face detection algorithm. Face is detected and eye coordinates are acquired using state-of-the-art Neurotechnology VeriLook face detection and recognition algorithm. Geometrical normalization of face image according to proportions and photographic properties in ISO/IEC 19794 standard. Intelligent image padding algorithm for cut of parts of token face image as in ISO/IEC 19794 standard. Background uniformity – the background in the token face image should be uniform, not cluttered. Sharpness – the token face image should not be blurred. Too light or too dark images – the token face image should not be too dark or too light. Exposure range of an image – the token face image should have a reasonable exposure range to represent as much details of the subject in the image as possible. Evaluate token face image quality based on suggestions of ISO/IEC 19794 standard (Using the quality criteria above). NFIQ component. The component includes the NIST Fingerprint Image Quality (NFIQ) algorithm, a standard method to determine fingerprint image quality. .NET wrappers for each module are included. *Token in this context is used as "symbolic image, good enough image for machine recognition". Token Image as in ISO/IEC19794-5: "A Face Image Type that specifies frontal images with a specific geometric size and eye positioning based on the width and height of the image. This image type is suitable for minimizing the storage requirements for computer face recognition tasks such as verification while still offering vendor independence and human verification (versus human examination which requires more detail) capabilities."